NYC: I Just Wanna Dance! Sometimes all you wanna do is dance. So come do that Uptown on April 20th! Let samba be your high ;). 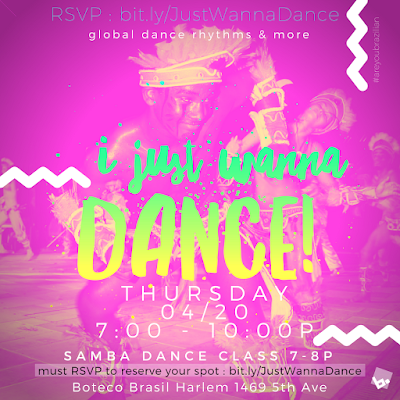 I'll be teaching a samba dance class, you get a caipirinha, and you get to rock with global beats and rhythms the rest of the evening. RSVP now, space is limited for the dance class. We'll be rocking at Boteco Brasil in Harlem, the only authentic Brazilian botequim Uptown.